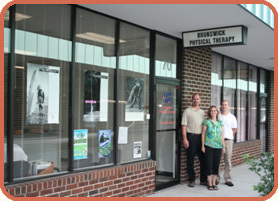 Welcome to Brunswick Physical Therapy! Brunswick Physical Therapy located in Frederick County Maryland specializes in the provision of comprehensive physical therapy services. Our services cover a wide range of orthopedic, sports and work related injuries and post operative care for ages 8 and up. We strive to offer a professional and caring environment with a strong emphasis placed on direct patient-therapist care. This includes a thorough educational component to teach the patient about the origin of their impairment as well as the means to resolve it in the most efficient manner. Our goal is to restore, maintain and promote physical function, fitness and optimal quality of life relative to injury, impairment or disease. We pride ourselves on our "hands on" and goal oriented treatment philosophy, which emphasizes patient education, manual techniques and functional therapeutic exercises. Treatment is carefully tailored to meet the individualized needs of each of our patients based on their personal goals. If you're tired of being treated in an assembly line fashion, tired of trying to get multiple practitioners to take the time to listen to what you have to say and give you the treatment time you deserve and need, or if you don't feel you are being treated as a whole person(as opposed to a single joint injury) then Brunswick Physical Therapy was designed for you. We don't have clocks in our treatment rooms. We do respect your time and provide you with the treatment you need without watching the clock. Our founder started Brunswick Physical Therapy after becoming frustrated with the recent trend in physical therapy of trying to satisfy shareholders instead of patients. Please remember that when your physician, podiatrist, or other health care practitioner writes a referral for physical therapy it is your choice where you attend. We see most of our new patients within 48 hours and often the same day. There is no reason to wait 2-3 weeks to start your physical therapy services. It does not matter what facility is written on the referral pad. Your referral/prescription will be accepted here.